Thekkady is located in Idukki district of Kerala. This is the location of unending chains of hills and spice scented plantations. India ‘s largest wildlife sanctuary Periyar National Park is located here. The wild life sanctuary was declared as a tiger reserve and elephant reserve. 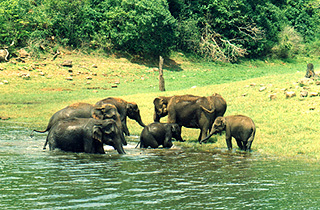 This ever green forest offers the unique experience to watch the wild elephants, tigers, sambars, gaurs, deers, wild dogs, lion, foxes, leopards, tailed macaques, reptiles, birds and Nilgiri langurs.The main attractions of Thekkady are the herds of wild elephants and other large animals that come down to play in the Periyar lake. The sanctuary can be watched through a treks, mountain walks or boating. The best time to visit Thekkady (chances of spotting wildlife )is during summer( March – May )season. Nearest Railway Station: Kottayam ( 120 km ). Nearest Airport: Cochin International Airport ( 190 km ). Bus route is connected by road to Ernakulam and Kottayam.